Is it getting worse? Why Brunswick? Posted on 08. Jul, 2008 by Fieldhammer. 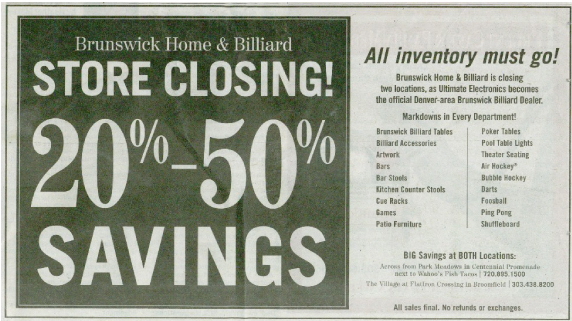 I just got news that Brunswick is pulling the plug on their Brunswick Home & Billiard stores in Denver. I guess back in 2003 they thought opening company owed retail stores might be a good idea. They opened 2 stores in Denver and one each in Chicago and Boston. Now that times are tough they are closing the two in Denver. No idea about the other two locations. Brunswick has been the market leader for pool tables and game room furnishings since 1845 because we offer the industry’s largest selection of high quality product, backed by a lifetime warranty and supported locally by the best dealer network in the business. We offer something for all tastes and budgets, from legendary heirloom-quality furniture, to traditional yet durable pool tables starting at just $1,499. All of our products are installed in your home with the same level of world-class service and attention to detail. Don’t be fooled by competitors who arbitrarily inflate their retail values so they can offer the perception of huge savings and then use independent contractors to coordinate your installation. 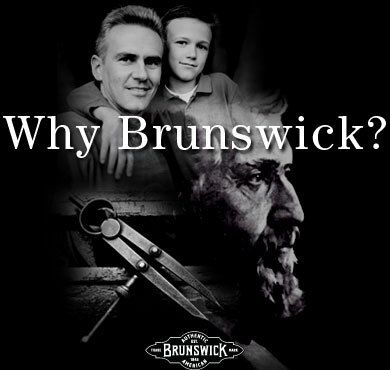 There are real reasons why families and professional players for over 161 years have chosen Brunswick over the competition. 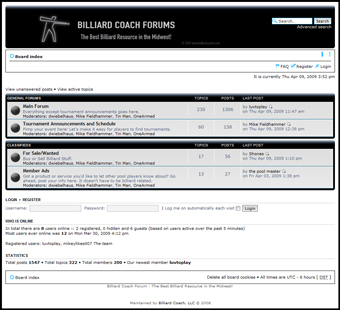 With Brunswick you get the best products and service at competitive prices everyday.